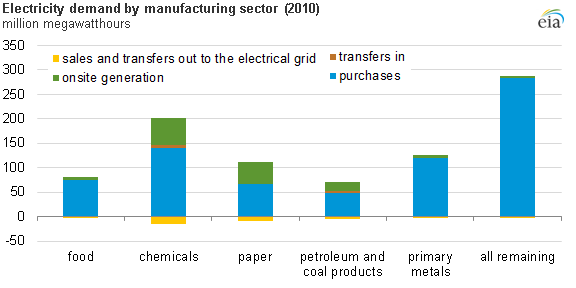 Many industrial electric facilities have the economic option of generating their own electricity or pulling directly from the electric grid to run their processes, though most electricity use at industrial facilities comes from purchases through the grid. Traditionally, an industrial onsite generation project is developed by a facility that intends to meet its electric and heat demands on its own. In addition, recent reports on devastating, weather-related events have also identified increased system resiliency and operational benefits of onsite generation. Some facilities require generation onsite to produce both electricity and heat that is also used in their industrial process (these facilities are generally referred to as industrial combined heat and power, or CHP). Other facilities have smaller needs for electric generation and instead just pull electricity from the grid, similar to a commercial or residential building with no generation onsite, though small generator units do operate in the United States. 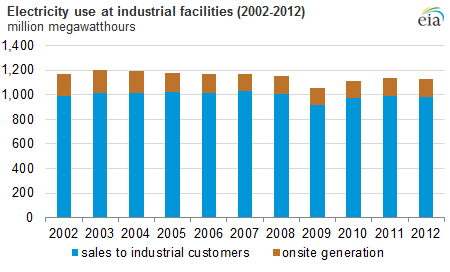 Large industrial customers (including both those with and without onsite generation) often participate in demand response or load management programs that allow grid operators to reduce the amount of electricity they are using in times of high demand. Recent extreme weather events such as Hurricane Sandy (and before that Hurricanes Isaac, and Irene) highlighted the benefits of onsite generation at industrial facilities as contributors to resiliency during widespread power outages.